The inevitable consequences of climate change will put some of California's people and communities more at risk than others. Because of location and a limited capacity to adapt, vulnerable populations may face profound and disproportionate harm. California's Climate Adaptation Strategy planners are seeking ways to address this potential harm. The California Adaptation Strategy (CAS) Working Groups are seeking to address the impact of climate change on the state’s vulnerable populations. 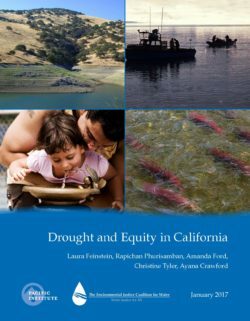 This analysis therefore asks how California can create a policy environment for equitable adaptation processes and outcomes. 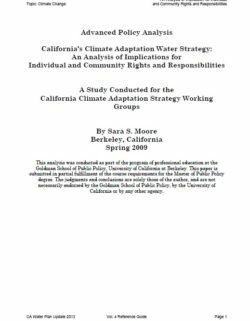 This analysis begins with a literature review on equity issues in adaptation planning, then examines the Water Working Group’s draft climate adaptation strategies, and then presents the results of twenty-six expert interviews. Two key concerns in the development of adaptation policy that arise in this analysis are feedback loops between vulnerable communities and policymakers and direct access to resources to enable greater adaptive capacity. 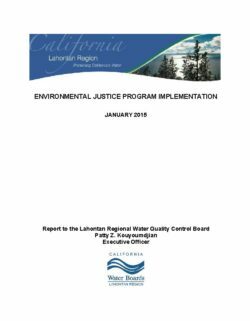 While this analysis looks closest at the Water Working Group’s strategies, it is anticipated that many of the findings will apply to the overall strategy. California’s ongoing drought has wide-reaching impacts, from how we grow crops to the price of electricity. Often overlooked is its impact on disadvantaged communities. 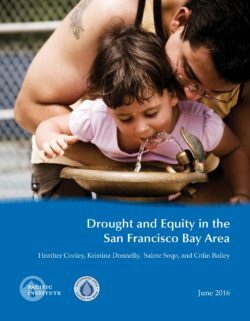 The Pacific Institute and The Environmental Justice Coalition for Water (EJCW) conducted community-based participatory research with eight Bay Area community-based groups to explore and document the drought’s impacts on low-income people in the San Francisco Bay Area. 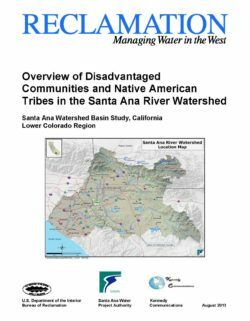 This report provides a brief description of Disadvantaged Communities (DACs) and Native American Indian Tribes (Tribes) located in or near the Santa Ana River Watershed (SARW), and a summary of water and related resource opportunities and challenges facing these entities. The information was gathered from several sources including personal interviews, web research, documentation review, and publicly available information. This report addresses DACs and Tribes separately, as they each have very different and distinctive demographics and economic bases. 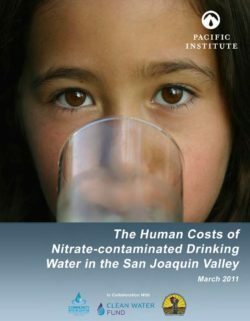 This document is not meant to be an exhaustive analysis of their unique factors, but rather an introduction and, in some cases, an overview of these populations and their unique water resources requirements. 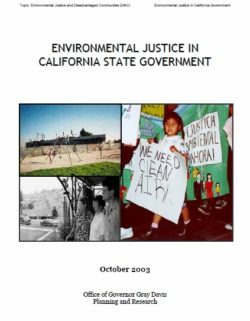 There are legitimate water quality issues that impact low income and Tribal communities throughout the SARW, but some perceptions of unsafe water where water supplies are clearly safe for public consumption identify another problem. 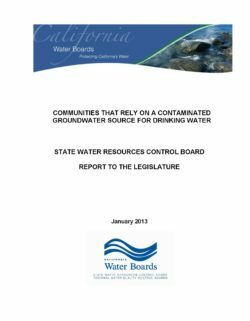 The solution to these issues is to ensure that all communities have the information, financial and technical resources, and administrative and regulatory policies they need to make informed decisions that can result in benefits to all members of communities within the Watershed. 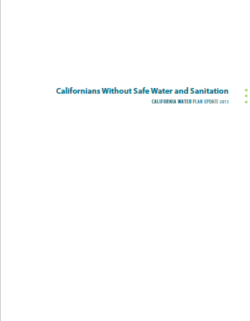 One of the key provisions found through this research that could assist DACs is the 1996 Safe Drinking Water Act (SDWA) Amendments and the 2006 Safe Drinking Water State Revolving Fund (DWSRF) program. Through the DWSRF, states can provide below-market interest rate loans to publicly and privately owned community water systems and nonprofit non-community water systems for necessary infrastructure improvements. States may also establish separate eligibility criteria and special funding options for economically disadvantaged communities through this program. 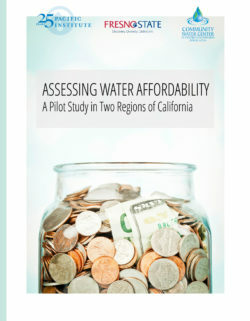 Section 1452 of the SDWA defines a disadvantaged community as “the service area of a public water system that meets affordability criteria established after public review and comment by the State in which the public water system is located.” Under this section, states may provide additional subsidies (including forgiveness of principal) to communities that meet the established criteria, or that are expected to meet these criteria as a result of a proposed project. Though no special provision was found related to Tribes, the U.S. Environmental Protection Agency (EPA) supports “Tribal Assumption of Federal Environmental Laws” under federal statutes, stating, among other things, that “[t]he Agency will recognize tribal governments as the primary parties for setting standards, making environmental policy decisions, and managing programs for reservations, consistent with Agency standards and regulations.” Three Federal environmental statutes - the SDWA, the Clean Water Act, and the Clean Air Act - explicitly authorize EPA to “treat tribes in the same manner as states” for purposes of implementing various EPA environmental programs that may be of benefit to these communities.